So that's the way to do it - put Punch and Judy back in their box and treat Labour's chief whip, Hilary Armstrong, like the puppet couple's screaming baby. Alright, David Cameron didn't actually throw Ms Armstrong downstairs or threaten to feed her to a crocodile - but she may well have wished something would swallow her whole after his withering put down. That's the problem with these sessions, denounced the new opposition leader only seconds into his first question. "The government chief whip shouting like a child. Has she finished, have you finished?," he demanded. "Well, punk, have you," he, unfortunately, didn't add. That would have been a bit too confrontational. In his first question time against Tony Blair, Mr Cameron was almost unnaturally even frighteningly relaxed, consensual and confident. That must be what the public school education buys. He had clearly determined to live up to his pledge to change the nature of these weekly question time sessions and, in effect, kill the prime minister with kindness - although he almost broke that resolution by firing off "you were the future once" at Mr Blair. That one hurt, largely because some of Mr Blair's backbenchers appeared to snigger at it. 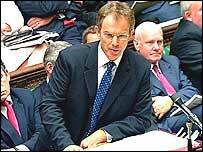 And hammering home the wedge between Mr Blair and his own MPs was central to Mr Cameron's approach. He welcomed the prime minister's education reforms, but suggested he wouldn't be able to get any of it through the Commons without Tory votes. And it was the effect Mr Cameron's approach had on Labour MPs which was so astonishing. After the slap down to their chief whip, they just didn't know what to do and question time fell extraordinarily silent. Well, perhaps not silent, but well down the screaming scale. They must have known what to expect, assuming they believed all his pre-question time promises. But they just sat there like a marching band whose drums and whistles had been stolen. The prime minister had clearly prepared himself for this love-in and adopted an equally consensual approach, albeit while trying to stress the real differences in policy between the two of them. He even told himself off for finger-pointing with a Joyce Grenfell-esque: "Tony, don't do that." 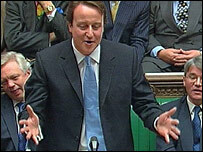 He looked just as relaxed and confident as did Mr Cameron - but then he's been at it for eight years not eight minutes. But no one really expects this to last. Mr Cameron cannot come to PMQs every single week and agree with the prime minister. At first it will look fresh, modern and in touch with what voters want. The danger is it might quickly start to look tired and just a bit creepy. And that is when Mr Punch is likely to be brought out of his box, dusted down and pitched back into the fray.